Photo L to R: Hon. Sam Valleriani, Monroe County Court Judge; Hon. 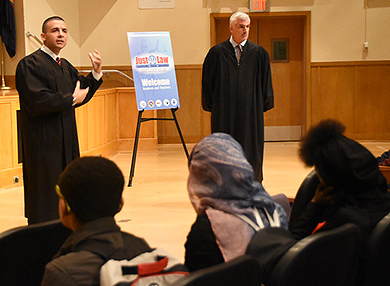 John Demarco, Acting Supreme Court Justice, Monroe County Court Judge and Supervising Judge for Treatment Courts speaking to students at a Just Law Event on September 28, 2018 at East High School, Rochester, New York. Photo Courtesy: City of Rochester. Promotional Video - Courtesy: The City of Rochester.